As the 19th century progressed, Americans journeyed Westward toward the promised Golden Land of California. They expected to find gold, but what they found was sand—lots of it, in the dry arid desert regions that lay in Arizona and along the border of Nevada and California. Concerned this topographical feature would impede attempts to establish transportation routes in the Southwestern states, one man was determined to implement an unconventional solution. In 1855, Jefferson Davis—yes, that Jefferson Davis—successfully convinced Congress to fund the very first Camel Corps. Inspired by reports of the dry, desert region of the newly acquired American Southwest, Davis believed that camels would provide the best mode of transportation for military exploration of the region. It would take just over 10 years to get the idea off the ground. There are two accounts that explain how the idea of the United States Camel Corps came to the future, one time Confederate President. According to the first, the argument for a Camel Corps was brought to Davis’s attention when he was Senator from Mississippi. Captain George H. Crosman had composed an extensive study for a Camel Corps that, in his mind, would improve Army transportation in Southwestern state regions, but his report was ignored for the better part of 10 years. It wasn’t until Major Henry C. Wayne relayed the idea to Senator Davis that Crosman’s idea took off. Then there’s General Edward F. Beale. Beale was a renowned military officer, frontiersman, and friend of the famed mountain man Kit Carson. According to an account written by Beale’s son, General Beale came up with the idea of using camels for military transportation when he and Kit Carson were exploring Death Valley. As with Crosman, Beale’s idea of ungulate transportation eventually reached the ears of Senator Davis who, unlike those before him, loved the idea. Whichever account is true, Davis had true enthusiasm for the Camel Corps. 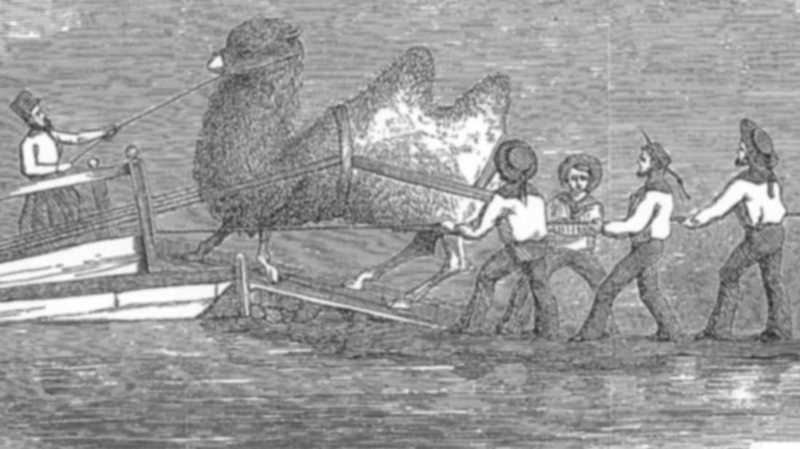 In 1853, as the newly appointed Secretary of War, Davis was finally able to seriously push his camel agenda. It only took him two years to fully convince President Franklin Pierce and Congress of “the advantages to be anticipated from the use of camels and dromedaries for military and other purposes.” Needing no further persuasion, Congress granted $30,000 to fund the unusual project. In May 1856, the first animal members of the Camel Corps—70 total—reached American soil, and the Army Camel Corps set to work. The camels were everything Jefferson Davis promised they’d be. They were strong, sturdy animals that navigated difficult terrain and required less water than any military quality mule or horse. The camels also proved exceptionally useful in military survey missions that stretched from Big Bend to the Benicia Arsenal. Too bad they were difficult to handle: Unfamiliar with dromedary temperaments, military personnel had a tough time managing their new steeds, and their horses and mules were often spooked by the strange animals. The experiment, which lives on as one of the more unusual tidbits of American history, would be short-lived. 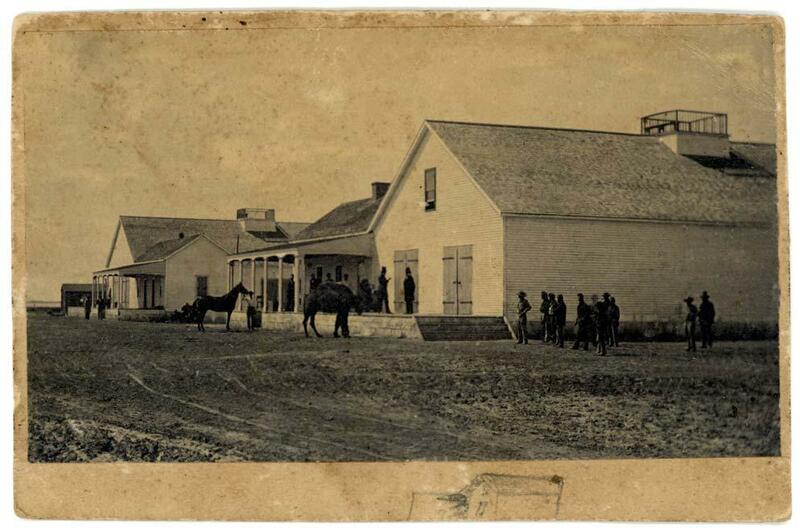 When the Civil War broke out in 1861, budget cuts forced the Corps to disband. In need of additional funds, the Union Army sold some camels to private owners; some managed to escape, and there were feral camel sightings in deserts throughout the West, and even British Columbia. The last confirmed sighting happened in 1941.